Create a folder, cd into it and initialize your git repo. If you run this command with the <app_name> heroku will choose a new random name for you. 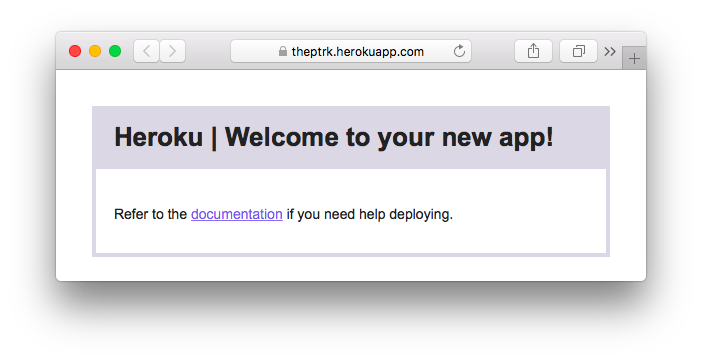 In the picture above, https://theptrk.herokuapp.com is the new url for your blank app. * If you ran heroku create in your app directly this step will be done automatically. If you dont see heroku, continue with this step. 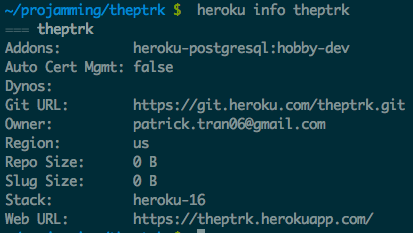 ** Note that heroku commands return different things depending on where you are. Set the node version package.json to the one on your local machine. This is the script which is run whenever the command npm start is run. Heroku will use this “start’ script as the default script if no Procfile is found. Postgres instances are created and assigned to individual apps as “add-ons”. Use this command to see all your existing add-ons. ** Note that heroku addons performs differently depending on where you are. If heroku recognizes that you are in a heroku app, it will only show you the add-ons for only that app. cd to a directory that is not a heroku app (say your home directory) and heroku will show you all add-ons for your account. Congrats! You now have a heroku app instance and PostgreSQL instance. 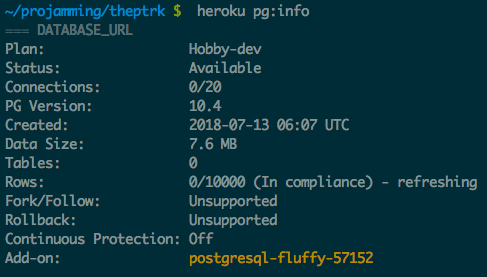 If you want to connect your app to your db, note that heroku automatically created a DATABASE_URL config variable for you. Type heroku config to see your current config variables. You can access this variable with process.env.DATABASE_URL in your application code.